Initiated at Eyebeam Art and Technology Center in an Artist's Residency July-December 2009. In continuing development at StudioBlue, New York City College of Technology. Team: Nick Wong, Jaymes Dec, Soyoung Park, Saki Sato, Young Jin Chung. html-movement-library live feed: Ursula Endlicher - and the audience! $"##', a re-staging of John Cage's 4'33"
Ursula Endlicher's work resides on the intersection of Internet, performance and multi-media installation. Since the mid-90s the Internet has had an impact on her practice, which bridges the Web and physical reality. 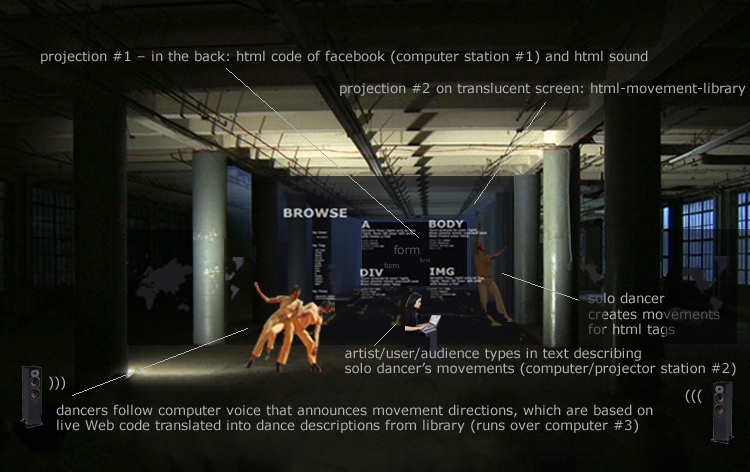 She uses the Web’s 'hidden' language—its HTML code—to choreograph performances, visualizes HTML in installations, and translates it into sound. Her work was recently shown at Theater am Neumarkt in Zürich, Switzerland; at Quartier21/Museumsquartier, Vienna, Austria; at BM-Suma Contemporary Art Center in Istanbul, Turkey; at Woodstreet Galleries, Pittsburgh, PA; at Artists Space, New York, and at the LMCC Swing Space@Seaport in New York. She received commissions from Turbulence.org/New Radio and Performing Arts, Inc., and from the Whitney Museum for its artport website. Her work is included in Rhizome’s Art Base, and in the ursula blicke videoarchiv at Kunsthalle Wien, Austria. Endlicher has lectured about her work internationally and has contributed to several publications about net art, performance and interactivity; she discusses these topics on her blog, Curating Netart, which she runs together with Ela Kagel. She was born in Vienna, Austria and lives in New York since 1993. Endlicher’s work can be seen at http://www.ursenal.net. Michael Sarff and Tim Whidden formed the artist collaboration MTAA (M.River & T.Whid Art Associates) in1996. 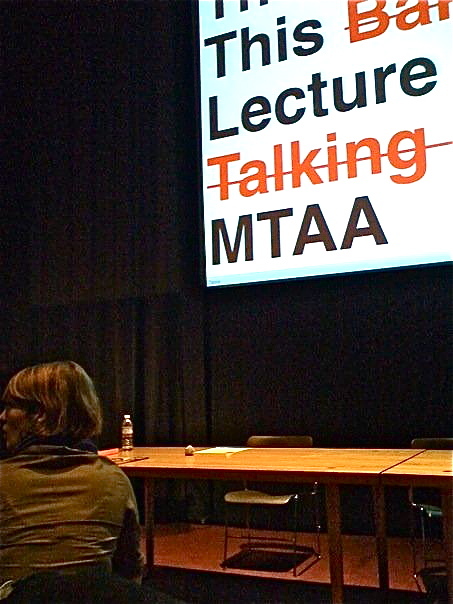 In New York City, MTAA has presented artworks and performances at The New Museum of Contemporary Art; P.S.1 Contemporary Art Center; The Whitney Museum of American Art; Postmasters Gallery and Artists Space. 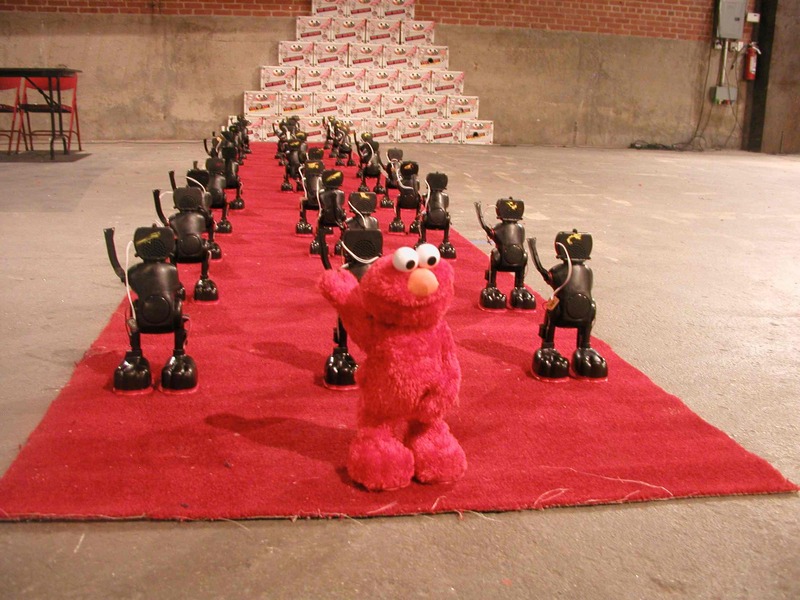 Their work has also been shown at The Walker Art Center in Minneapolis; The Beall Center for Art and Technology in Irvine, CA; The Getty Center in Los Angeles and SFMOMA in San Francisco, CA. International exhibitions include the Seoul Net & Film Festival in Korea, and Videozone2 - The 2nd International Video Art Biennial in Israel. MTAA has received grants and awards from the Creative Capital Foundation, Rhizome.org, Eyebeam and New Radio & Performing Arts, Inc. Both members of MTAA live and work in Brooklyn, New York. Christiane Paul is the Adjunct Curator of New Media Arts at the Whitney Museum of American Art and the director of Intelligent Agent, a service organization dedicated to digital art. She has written extensively on new media arts and lectured internationally on art and technology. An expanded new edition of her book Digital Art (Thames & Hudson, UK, 2003) was published in spring 2008 and her edited anthology New Media in the White Cube and Beyond - Curatorial Models for Digital Art (UC Press) in December 2008. Upcoming and recent curatorial work includes "Scalable Relations" (Beall Center for Art + Technology, Irvine, CA, and other venues); "SOS 4.8" (Murcia, Spain, 2008); "Feedback" (Laboral Center for Art and Industrial Creation, Gijon, Asturias, Spain, 2007); and "Profiling" (Whitney Museum of American Art, 2007). Christiane Paul teaches in the MFA computer arts department at the School of Visual Arts in New York and the Digital+Media Department of the Rhode Island School of Design. Adrianne Wortzel creates interactive web works, robotic and telerobotic installations and performance productions, which explore historical and cultural perspectives by coupling fact and fiction via use of new technologies in both physical and virtual networked environments. They reflect her immersion in the sciences, sometimes with direct collaboration. The National Science Foundation; Swiss Artists-in-Labs Program; Artificial Intelligence Laboratory-University of Zurich; Franklin Furnace Fund for Performance Art; PSC-CUNY Research Foundation and Greenwall Foundation have supported recent projects. Recent works include: archipleago.ch, a video in progress depicting a "galapagos" where indigenous creatures are the robots created by researchers at the Artificial Intelligence Laboratory; Eliza Redux, an interactive collaborative work (elizaredux.org) where a physical robot offers virtual psychoanalytic sessions emulating Joseph Weizenbaum's ELIZA; The Veils of Transference, a video depicting a psychoanalytic session between a human and a robot where their roles become dynamically interchanged. Wortzel's telerobotic installation Camouflage Town was exhibited in Data Dynamics at the Whitney Museum of American Art (2001). Her play Sayonara Diorama, which she wrote and produced, featured human and robotic actors recounting a fictive second Voyage of the Beagle. Adrianne Wortzel is a Professor of Entertainment Technology at New York City College of Technology-CUNY, a member of the doctoral faculty of the Interactive Technology and Pedagogy Certificate Program at the CUNY Graduate Center, and an Adjunct Professor of Mechanical Engineering at the Cooper Union for the Advancement of Science and Art. Support for this event was provided, in part, by the Experimental Television Center's Presentation Funds Program, which is supported by the New York State Council on the Arts, a public agency.